For one Oxford family, a sense of adventure and a love of sailing is second nature. For many, sailing around the world is akin to orbiting Mother Earth but, for the Johnsons, it’s a part of their DNA. Jessica and Richard Johnson, along with their two teen daughters, Emma and Molly, plan to embark in November 2017 to circumnavigate the world using an ambitious route far from the typical coconut run. 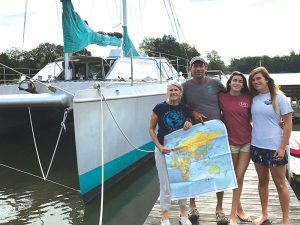 Elcie’s homeport is Boone Creek in Oxford where the crew – Richard, Jessica, Emma (16) and Molly (14) Johnson – are busy planning their circumnavigation around the world. Richard and Jessica, both USCG licensed captains, met while working for the Sea Education Association and envisioned a life afloat. 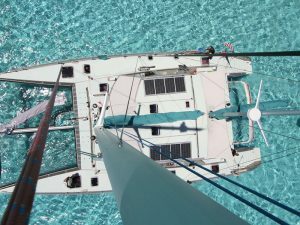 With more than 50,000 nautical miles under her keels, Elcie, a 62’ bluewater catamaran custom-built of aluminum in New Zealand in 2009, is a proven sailor – as is her full-time crew. Daughters Emma and Molly stand regular watches and perform ship’s duties. 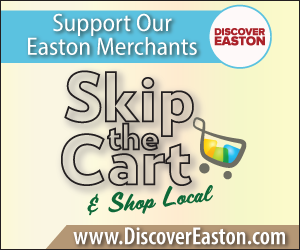 This will be Elcie’s third trip to the Pacific and the Johnson’s second circumnavigation. With a background in sail training education, the Johnsons have always enjoyed introducing additional crew to their passion for offshore sailing and the cruising lifestyle. Applications are being accepted now for expense-sharing expedition members who want to join one or more legs of a similarly ambitious circumnavigation with Elcie Expeditions. Elcie will call at many ports, including mysterious Easter Island, remote Pitcairn, Tin Can Island and Southeast Asia. The entire voyage will consist of 27 coastal and offshore legs that range from six to 31 days. The shortest leg is the Panama Canal Transit. The longest is a passage across the South Atlantic. The circumnavigation will round the Cape of Good Hope in Africa. Those joining as expedition crew are encouraged to take part in Elcie’s operation, including standing watches, making sail changes and even joining in the galley fun from time to time. While prior sailing experience is a benefit, enthusiasm and willingness to learn are probably the most important qualities of a good crew and shipmate. Having a sense of adventure is also helpful, as parts of Elcie’s ambitious route will be far from the typical coconut run. A second aspect to Elcie’s voyage is something called the Sail to See Expedition. Since the girls are home schooled during their time at sea, the Johnsons wanted to share their experiences with other students. The Sail to See Expedition has a mission to connect with students and classrooms through a website developed by the Elcie crew at www.sailtosee.org. A bi-weekly logbook entry on the website will allow students to follow along as the crew reports on the passages, ports of call and environmental issues affecting the places they visit. The crew of Elcie will report via photography and video on their blogs. Some Citizen Science is also planned for the voyage. Recently accepted into the 5 Gyres Institute’s Trawlshare program, the crew of Elcie will also be towing a plastics-collecting trawl at intervals to contribute data to a Global Estimate of Marine Plastic Pollution. The family is also tapping in to the Worldwide Voluntary Observing Ship Program through the National Oceanic and Atmospheric Administration (NOAA) where they will post regular weather updates during their voyage. For anyone interested in joining the expedition as expense-sharing crew, learning more about Sail to See or just vicariously following along on the voyage, more information and the itinerary can be found at www.sailtosee.org or www.elcieexpeditions.com or call Richard and Jessica at 410-226-6036.